Fred Kovaleski ’49, center, with the William & Mary men's tennis team. Courtesy of the WMAA Archives. Kovaleski lived an adventurous — and at times dangerous — life, traveling the world, rescuing prisoners during the Second World War, spying on the Soviet Union and playing on the tennis circuit all within just a couple of decades. The story of this remarkable man has been well-documented in national publications over the years, most recently in The New York Times. But what many people do not know is the story of how a boy from humble beginnings in a small community of Polish immigrants outside Detroit ended up at William & Mary. And it all started with tennis. His adventures at William & Mary began when his high school gym teacher and mentor, Jean Hoxie, saw a lot of potential in Kovaleski, particularly with his impressive skills on the court. According to Kovaleski in an interview with the W&M Alumni Magazine in 2010, “Hoxie says to me ‘I want to get you out of this town. You’ve got to leave this environment.’” So she called her friend Sharvey Umbeck, tennis coach at William & Mary, and arranged for Fred to go to the College to play on the team. In the fall of 1942, Kovaleski became a William & Mary student. But not for long. After just a few months at the university, he signed up for the war effort as an air cadet. In 1945, as a paratrooper with the 11th Airborne, he liberated 2,100 internees from a Japanese internment camp outside Manila, earning a presidential citation. After the war, Kovaleski returned to William & Mary on the G.I. Bill to finish his degree and play on the tennis team. "There was no question I was going back to William & Mary," he said. "Most of us who had come back after the war had matured substantially. We knew we wanted to make the grade, get our degrees and move on with our lives." 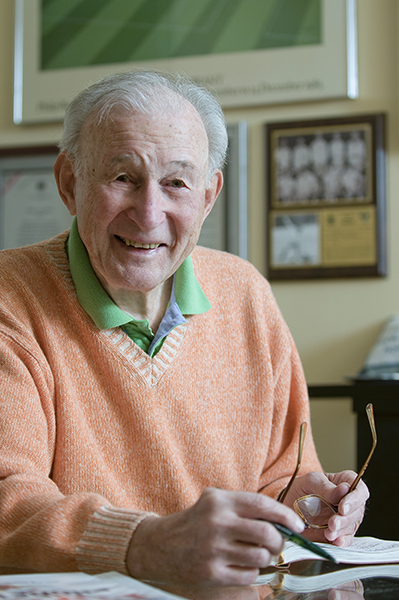 With the men's tennis team, he helped win William & Mary its only NCAA national championships in 1947 and 1948. He was somewhat of a campus celebrity, often written about in the Flat Hat, William & Mary's student newspaper. After graduating in 1949 as a government major, Kovaleski began playing tennis all over the world on the amateur circuit. He was recruited by the CIA after meeting Counselor of the Embassy Joseph Sparks in Cairo in 1951. "Fred, whenever you decide you're going to stop touring around, write me," said Sparks. "I'll send letters of introduction to a number of people I know in the State Department. You look to me like you'll be a good candidate." Kovaleski took him up on his offer and began training, returning to Williamsburg, Virginia — this time to Camp Peary instead of his alma mater. Having learned Russian during the war, he was put to work training Soviet Army defectors. But never one to stay in a place long, he returned to Cairo to tap the Soviet embassy's phones, all while under the cover of playing tennis. It wasn't just translation work, either. He was also out in the field, at one point rescuing a Soviet defector. "You never met a more dedicated or committed group of young men in your life," said Kovaleski about his fellow spies in Egypt. "I mean, all of us, we were ready to jump out of planes, live in tunnels, do whatever the agency wanted." While there he fell in love with Manya Jabes, a woman of Russian descent. The CIA did not approve of their marriage, so Kovaleski left their service, choosing love over his career at the CIA. He moved to Sudan to work for Pepsi. A few years later, CIA came calling again — this time to offer not only Kovaleski but also his wife Manya a job translating Soviet tapes, a change of heart Kovaleski found wryly ironic. They accepted, moving from place to place using Kovaleski's job at Pepsi as cover. Once their son Serge Kovaleski ’84 was born in 1961, though, they decided to leave spycraft behind. That didn't mean their traveling days were over, though. They moved to Australia, continuing to see the world, then settled in Manhattan. Serge is now a Pulitzer-prize winning journalist at The New York Times. He wrote about his father's career as a spy in The Washington Post Magazine in 2006. "The real highlight for me was just the joy of sitting down with my dad every day for five weeks or so and having him share his awe-inspiring life with me," Serge said in an interview with the W&M Alumni Magazine in 2010. "Yes, it was journalism, but I felt like I was being given a precious gift." Learn more about Fred Kovaleski's adventures in the Spring 2010 William & Mary Alumni Magazine.